William Echard “Bill” Keeney: historian, university administrator and peace activist, was born 12 July 1922, in Fayette County, Pennsylvania, USA to William Leroy Keeney and Kathryn Olive Echard Keeney. On 12 October 1947 he married Willadene Hartzler (24 September 1924- ); they had two daughters and two sons. William Keeney died 12 November 2006 in Bluffton, Ohio. Bill grew up in a coal mining family, one of 50 families selected to participate in Penncraft, a community development program founded by Quakers. At Penncraft the family was befriended by a Mennonite pastor Carl Landes, who helped Bill to attend Bluffton College (Ohio). There in 1941 he encountered Mennonite peace teaching, which led to his becoming a Mennonite and finding in Willadene Hartzler, his life partner. Bill Keeney served three years as a conscientious objector in Civilian Public Service including mental hospital service. Bill helped launch the National Mental Health Foundation focused on energizing public concern for the mentally ill. He and Willadene also served with the Mennonite Central Committee in Germany and the Netherlands, where he became director. In 1950 Keeney returned to pursue a BTh degree (1953) at Mennonite Biblical Seminary in Chicago. There he helped establish Woodlawn Mennonite Church, where he served as assistant pastor, and was ordained to ministry by the General Conference Mennonite Church. In 1953 Bill went to Bluffton College as Assistant to the President. Bill took a leave from this position to earn a PhD (1959) in historical theology from Hartford Theological Seminary. His dissertation, "The Development of Dutch Anabaptist Thought and Practice from 1539-1564," was published in 1968. In addition to writing numerous book reviews for Mennonite Quarterly Review, Bill published several essays in MQR on the life and thought of Dirk Philips, and he played a significant role in the translation and publication of The Writings of Dirk Philips (1992) that appeared in the Classics of the Radical Reformation series. In 1962 he succeeded Harold Bender as chair of the MCC Peace Section. He served on peace delegations to Vietnam, Iran, Europe and Middle East. In 1968 Keeney became Academic Dean at Bethel College, where he gave innovative leadership in programs of experiential learning and helped to launch a department of peace studies. He became deeply engaged in the field of peace studies, both at national and international levels. 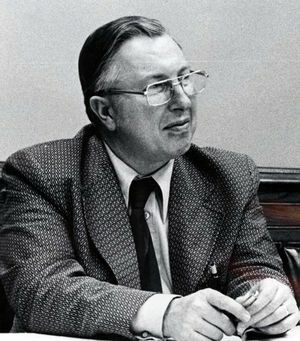 In 1979 Bill moved to Kent State University in Ohio to teach and direct the national office of COPRED (Consortium on Peace Research, Education and Development). In 1989 the Keeneys retired in Bluffton, where Bill continued to pursue multiple interests, including leadership in establishing the Mennonite-sponsored Chicago Learning Center. In 2005 Bill reflected thus on his life: "My decision to become a Christian and, therefore, a conscientious objector led me to become a Mennonite." In this he sought "to remain faithful to biblical principles and to being a follower of Jesus Christ." "Keeney, William E. (1922-2006)." Biographical Wiki - Mennonite Library and USA Archives. 2011. Web. 6 June 2016. https://mla.bethelks.edu/mediawiki/index.php/Keeney,_William_E._(1922-2006). Kreider, Robert S. “In Memoriam: William E. Keeney (1922-2006).” Mennonite Quarterly Review 81 (January 2007): 3-4. This GAMEO article is derived, with permission, from the MQR memorial article. “William Echard Keeney.” SAGA (Swiss Anabaptist Genealogical Association) Genealogical Website. Web. 13 June 2016. http://www.saga-omii.org/TNG10/getperson.php?personID=I23893&tree=sss-project. “William Echard Keeney.” Prabook. Web. 13 June 2016. http://prabook.org/web/person-view.html?profileId=584952. Keeney, William E. The development of Dutch Anabaptist thought and practice from 1539-1564. Nieuwkoop : B. de Graaf, 1968. Keeney, William E. Lordship as servanthood : thirteen lessons on the biblical basis for peacemaking. Newton, Kan. : Faith and Life Press ; Scottdale, Pa. : Mennonite Publishing House, 1975. This was also issued in Spanish and Portuguese. Dyck, Cornelius J., William E. Keeney and Alvin J. Beachy, trans, and ed. The writings of Dirk Philips, 1504-1568. Scottdale, Pa. : Herald Press, 1992. Kreider, Robert S. "Keeney, William Echard (1922-2006)." Global Anabaptist Mennonite Encyclopedia Online. June 2016. Web. 21 Apr 2019. http://gameo.org/index.php?title=Keeney,_William_Echard_(1922-2006)&oldid=135180. Kreider, Robert S. (June 2016). Keeney, William Echard (1922-2006). Global Anabaptist Mennonite Encyclopedia Online. Retrieved 21 April 2019, from http://gameo.org/index.php?title=Keeney,_William_Echard_(1922-2006)&oldid=135180. This page was last modified on 22 July 2016, at 18:51.